A startling depiction of life-changing journeys of no return by a rising star in Finnish fiction. From a rural, working-class childhood to a career at one of Helsinki’s most prestigious law firms, Susanna’s path in life has been longer than the miles alone indicate. Fatima’s journey to the doors of a Helsinki police station and, eventually, onto Susanna’s living room floor has been even more arduous: she has had to leave a child by the wayside and a husband behind in Iraq. Martta has never left her birthplace, yet she has been left behind, forced to surrender her loved ones, one by one: her firstborn on the doorstep of the vicarage, her husband to war and then to drink, her son to Sweden, her daughter to an unhappy marriage. All she has left is her great-grandson Luca, a boy who can’t seem to find his place in the world. (Never) Going Back is a deft portrayal of individual lives uprooted and inexorably entwined across time and space. 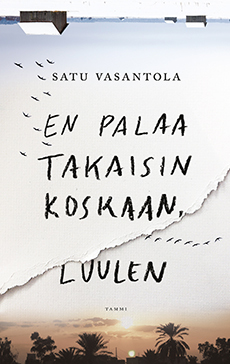 With bold, lyrical strokes, Satu Vasantola draws compelling portraits of today’s broken families and the struggle to survive in contemporary rural life. The narrative of an immigrant family reframes a Finnish family’s story, stretching a local canvas into a global backdrop. While solidly anchored in a changing Finland, (Never) Going Back perceptively depicts a changing Europe and a changed world. After all, the essence of life is universal. No matter who or where we are, we all have to stop from time to time to gaze up at the stars.